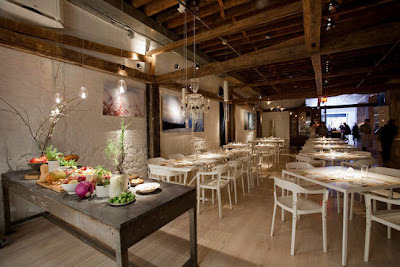 I just read a review in New York Magazine’s May 10th issue of the new restaurant located in ABC Carpet and Home in NYC. According to reviewer, Adam Platt, chef Jean-Georges Vongerichten’s latest endeavor, appropriately named ABC Kitchen, “takes local and seasonal dining to a higher plane.” Critique was favorable….and the décor looks fabulous! And it's in ABC...one of the greatest furniture and home furnishing emporiums on the planet! How could it not be amazing! Did Harry and Sally live happily ever after? Minimal, elegant, or just easier? Paula Deen, eat your heart out!